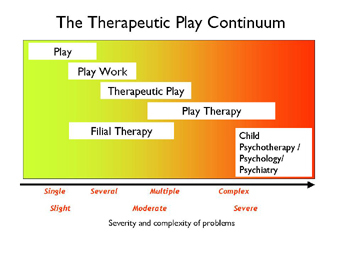 The Therapeutic Play Continuum was developed by Monika Jephcott and Jeff Thomas, whilst working for PTUK as a concept to explain the different applications of play in helping children with their problems. Definitions of each of the main terms are given and related graphically to each other in the Therapeutic Play Continuum diagram. Since there are overlaps between each application they may best be considered on a therapeutic continuum to deal with differing levels of severity of emotional, behavioural and mental health problems in children.